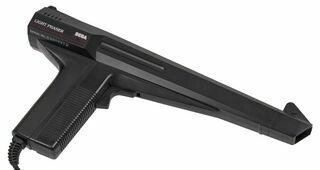 The Light Phaser is a light gun controller created by Sega for the Sega Master System. It is the Master System's equivalent to Nintendo's Zapper for the Nintendo Entertainment System or Atari's XG-1 for the Atari 7800 and XEGS. It was released alongside the Master System in the US in 1986, and also saw a release in Europe, Brazil and South Korea. No equivalent peripheral was produced for the Japanese market. The Light Phaser is a plastic gun consisting of a light sensor (in the tip) which is focused on a small area of the screen; and a trigger (which corresponds to Control Pad button 1). When the trigger is pulled, a compatible game flashes the screen in a way that is detectable by the light sensor, and hardware built in to the console allows the game to determine where the gun is pointing. The phaser is heavier than its Nintendo counterpart, but considered by some to have a more responsive trigger and more accurate targeting. The standard Light Phaser is entirely black. As with the Nintendo Zapper, the Light Phaser looked realistic enough to warrant parental pressure to alter the device, so that police would not confuse it with a real gun. Altered Light Phasers are distinguished by a hand-painted neon orange tip, and are much harder to find than their solid color counterparts. Tec Toy also released a blue Light Phaser in Brazil. In that same country in 2009, an unaltered Light Phaser was used to hold a woman hostage. Contrary to popular belief the Light Phaser was not modelled on the Sega-backed anime, Red Photon Zillion, in which characters use Light Phaser-shaped guns. It is in fact, the other way around - Zillion debuted in April 1987 several months after the peripheral was released in the United States. It is therefore more likely that the Zillion design was borrowed from Sega, similar to the Opa-Opa cameo who had debuted in Fantasy Zone in 1986. The Zillion Fighter Set, a light-gun tag toy developed by Sega, borrows the shell of the Light Phaser, but this too was released in 1987. As with all light guns, the Light Phaser was designed solely for CRT television sets, which were the standard for televisions during the 1980s and 1990s. The Light Phaser will struggle with LCD and plasma televisions and monitors, as well as projection screens. The Light Phaser is also incompatible with the Mark III as that system lacks the TH signal needed for the Light Phaser's light sensor. It is however compatible with the Japanese Master System, which has the TH signal present on both controller ports. 1 in the corresponding port register means "not pressed" or "dark"
0 in the corresponding port register means "pressed" or "light"
Main article: Light Phaser/Magazine articles.